In my recent photographic assignment, my task was to cover a company's Chinese New Year dinner at Pan Pacific Hotel Singapore. The organiser mentioned that this wasn't going to be any ordinary sit-down dinner but one that would let their staffs dance their night away - imagine the challenges any photographers would face i.e. Low lighting conditions, White balance issues (Powerful flood lights emitting a myriad of colours) and so forth. If you've seen any photos from your company's D&D or corporate events, those would usually make good keepsake photos but otherwise mediocre in my humble opinion. That is exactly why being a professional photographer, I am constantly thinking of how to move away from mediocrity to being stellar in what I do by regularly questioning myself on "How can I make my pictures better?" and "How can I make a difference by being different?". So I assessed at my gears, thought hard about it; that was when I realised that perhaps introducing some sort of a kicker light to the rear of the dance floor and stage would created some sort of separation (by hair light or lighting flare) between the subject and the background which would eventually create more interesting pictures. Anyway... I do regret that no photos of the event would be posted as the organiser has requested that no photos containing their staff be published anywhere in public. I have acceded to their request. 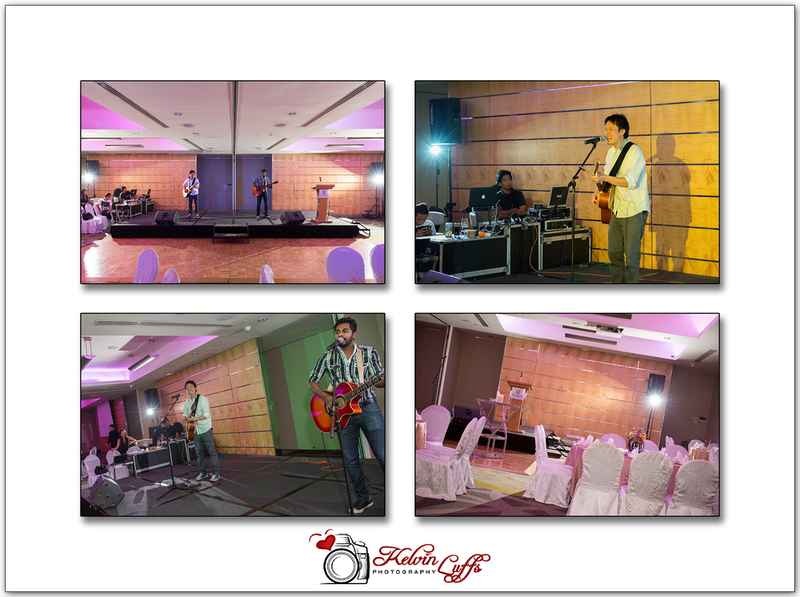 Hence, here's a collage of 4 pictures showing my lighting set-up with Jack & Rai rehearsing for the main gig.